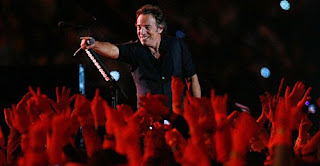 Bruce Springsteen at the Super Bowl: Were you sold? The National Football League announced in September that Bruce Springsteen and the E Street Band would provide the halftime entertainment at today's Super Bowl. Last week, Springsteen released an album that surely warmed the hearts of NFL and NBC execs. His "Working on a Dream" is largely an upbeat and positive pop record -- one without any deep political implications and plenty of PG-safe proclamations of love. In the post Nipplegate-era of halftime entertainment, that's just the way the NFL likes it. No risks, no surprises and nothing that's going to slow the momentum of one of the biggest rah-rah moments on American television. Oh, and keep the new stuff to a minimum. Springsteen got in a couple verses of the title track off his album, but it was straight into "Glory Days" just as the crowd was warming up to the cut's gospel groove. When you have 12 minutes, better go keep them wanting more, especially when dabbling with the unfamiliar. It was apparent that Springsteen and the E Street Band -- introduced as "booty-shaking" in a pre-taped reel of NFL personalities -- understood the game from the moment the performance started. "Step back from the guacamole dip," Springsteen yelled through gritted teeth. He then followed it up with this impassioned order: "Put! The! Chicken! Fingers! Doooowwwwwwwn!" Love him or hate him, is this what we want from one of our most celebrated songwriters? Springsteen's always been at the very least an artist who's unafraid to tackle big topics. He shouldn't be faulted for trying to drum up some excitement for his new album, but is it necessary for him to have to deliver jokes for the NFL to do so? Heading into the performance, the only major question was why Springsteen needed to sing in Tampa Bay today at all. The halftime show rakes in the viewers -- last year's Super Bowl was watched by a record 97.5 million people, according to Nielsen Media Research -- but it turns artists into pitchmen. In getting the spotlight for just 12 minutes, verses are dropped and melodies are clipped. It's not a concert, but a teaser -- and it was, admittedly, an entertaining one -- for Springsteen's upcoming tour, which comes to the Los Angeles Sports Arena on April 15 (tickets, conveniently, on sale tomorrow morning). While Springsteen has been saying that there are few outlets for an artist of his age to promote his music these days, the Bruce Springsteen Business hasn't exactly been dipping. According to Billboard, Springsteen tallied the second-highest grossing tour of 2008, bringing in a total gross of more than $204 million. But today's Super Bowl performance will net Springsteen a whole lot more than brisk ticket sales. In the days following his halftime performance last year, Tom Petty saw a 352% increase in digital track sales. The four songs performed today -- the set ended with "Glory Days" (you were expecting something else?) -- are surely rocketing up the iTunes sales chart as this quick reaction blog is being typed. There was, however, plenty to like, and Springsteen is one of the world's most successful live performers for a reason. The set began when the band broke into the swinging "Tenth Avenue Freeze-Out," striking a communal vibe from the start. If the easy-going saxophone sway of the tune was a surprising way to begin, Springsteen punctuated every note with a high-five to a fan and wasn't above a little lyric-altering pandering -- "bust this city in half" became "bust this Super Bowl in half." Indeed, when it comes to providing entertainment for big-time events, few are more fit for the job than the Boss. Fewer still can follow the likes of the Rolling Stones, Paul McCartney, Prince and Tom Petty and the Heartbreakers -- the artists who have been called upon to provide family-friendly entertainment since the Janet Jackson/Justin Timberlake debacle of 2004. In contrast to Petty's performance last year, Springsteen was more than eager to ham it up. The set ended with a gag-worthy shtick with Steven Van Zandt and a referee. When time was up, Springsteen egged the crowd on, suggesting the band play on and get taxed with an over-time penalty (ha!). Yet every bad moment was tempered with something good. Springsteen showed off his agility, even if he couldn't stop himself from sliding straight into a cameraman between "Tenth Avenue Freeze-Out" and "Born to Run." The look on Springsteen's face -- he was clearly struggling not to laugh -- seemed to imply the moment wasn't staged, which would be a true rarity in halftime gigs. And this was a moment to celebrate the crowd sing-along. Every lyric of a joyous rendition of "Born to Run" was hammered home with a fist-pump or a pyrotechnic display. "I wanna die with you Wendy," sang Springsteen, but he may as well have been cheerleading a punt return. If "Glory Days," a song built for sports nostalgia, was an obvious choice for a set-ender -- "Born in the U.S.A." is too political a tune for the NFL -- Springsteen proved himself to be a rather excited salesman. Give Springsteen credit. He was clearly enjoying the stage, although he misfired by changing the lyrics to "Glory Days," swapping out the dead-beat baseball player references for lame nods to football. But this was a Springsteen clearly caught up in the advertising-driven spectacle of the Super Bowl, and completely unashamed about all of it. His performance ended not with a statement -- but a sales pitch: "I'm going to Disneyland!"